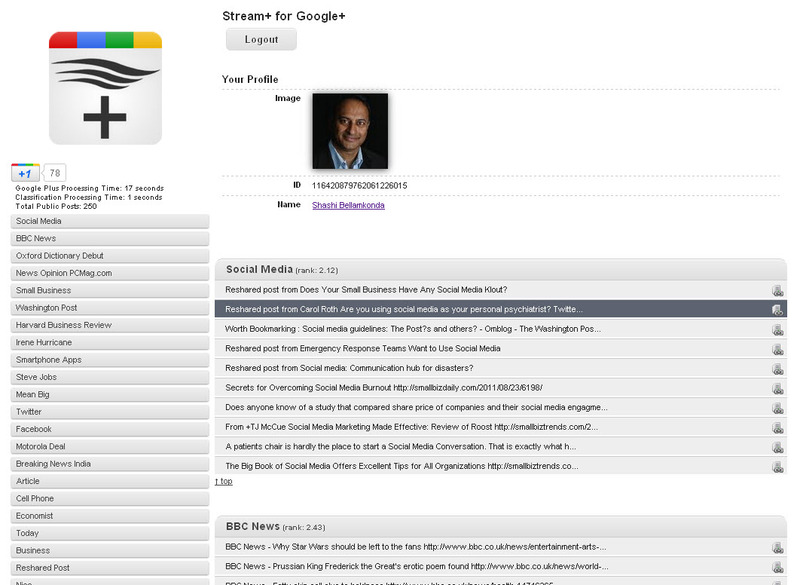 Google+ API announced and Stream+ App Launches | Happenings, Marketing and Technology Advice and Thoughts! Hat tip to Plusheadlines.com for the info that Google has a API for developers to use public streams of Google Plus. More info on this at the Google Developer Website. and the announcement by Chris Chabot, Google+ Developer Relations on the Google Plus Blog. One of the first app is Stream + available at http://stream-plus.appspot.com that lets you see all the posts that you shared in your stream in a easy format with categories automatically listed. Granted this is work in progress but the fact that you can now use API access to Google Plus will give rise to many new apps and also integration into existing apps. I could not find any other apps yet and let me know if you find others. What kind of app will help you ? I defintiely want one that show me all the +1 I have done across the net in a catalog format.